This traditional Cuban criolla is by Luis Casas Romero and Sergio Lavilla and arranged by Carlos Abril. When this stirring piece was sung at the Second International Choral Festival of Havana, Cuba, 2001, it was greeted with tears, thunderous applause, and hugs. 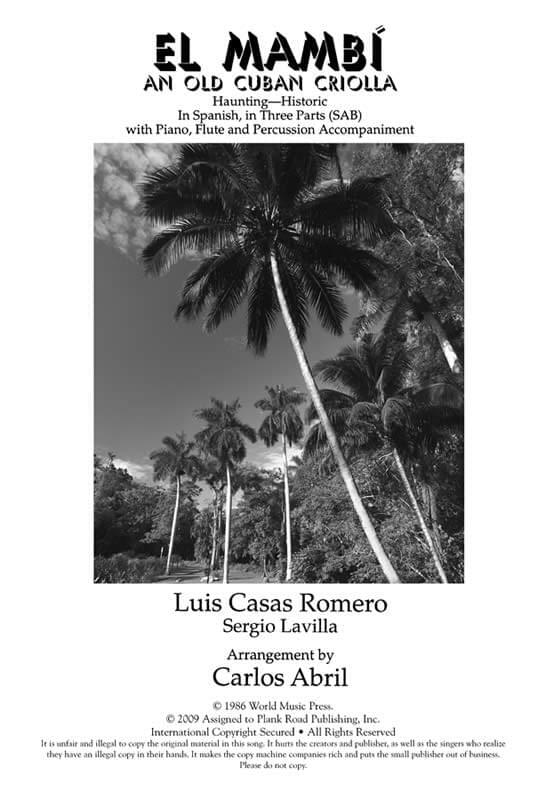 It is arranged in typical Cuban style and intended for voices, piano, simple percussion, and solo flute (or recorder) interlude. Also included is the translation and cultural information. The tune is fabulous for middle or high school festival choirs. SA; SAB; SATB.